Price Drop! Was: $89.95 Now: $59.88. For a limited time only, while stocks last. This 5 Level Tier Childrens Canvas Book Shelf Display Unit will keep your childs room neat and tidy. 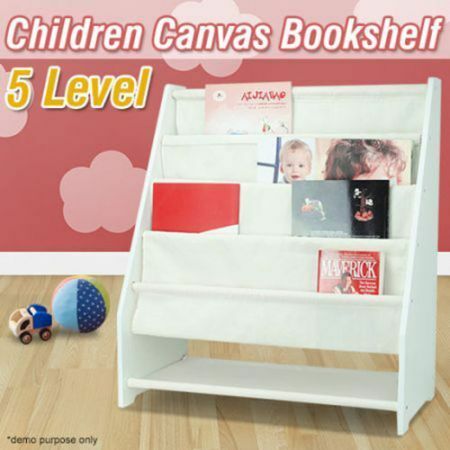 Store all your child's favourite books with this Children's Canvas Book Display. Shelving is made of soft canvas woven fabric with five levels of storage space so your child can store all their favourite books, novels, colouring books and magazines. The book shelf is compact in design and made of a durable painted MDF frame that is not only modern and stylish but easy to clean as well. Great storage solution for the bedroom or play area. The woven shelving can be removed for machine washing if needed. Minor assembly with all necessary components included. The book shelf has a light-weight design you can even move it from room to room so you always have a storage solution wherever it is needed. Sized perfectly for easy access for little hands and fingers. Clean up unsightly book clutter with this simple and appealing storage solution! Product Dimensions (W x D x H) 63.5cm x 30cm x 71cm approx. 34cm x 8.2cm x 75cm approx.